A lot of us think of wedding season as the spring and summer. It’s when brides can plan a wedding that revolves around the outside and she can choose beautiful, summery dresses for her bridesmaids. It’s the time when beach-crazy brides can have ceremonies on the sand and guests can linger on patios with bright, fresh cocktails. But lately there’s been a growing trend, and we are simply loving it: winter weddings are on the rise. There’s just something magical about a winter wedding. So why, exactly, is a winter wedding the best decision you could make for your own big day? Let’s analyze! Winter often means snow. And if you live where there is snow, you can have a gorgeous winter-white backdrop for the whole day. Nothing makes white LED lights look more like fairy sprinkles than lots and lots of fluffy white snow. Your wedding photos will be magical. Trust us. Color palettes. There is really no limit when it comes to winter weddings. Bold purples and reds look simply sumptuous while more neutral palettes with creams and soft silvers appear elegant and high-end. With winter, just about anything looks fantastic. Accessories! Winter accessories can make for gorgeous photos. Think warm, soft faux-fur stoles and cranberry-red plaid scarves and how vibrant they will look against winter-white dresses and snow. Winter weddings may be growing in popularity, but it’s still the best time of year to get some great deals with wedding vendors. Ask your venue and every other wedding vendor you work with if they cut special deals during the “off” season. Menu fun. Pick out a signature hot chocolate and liquor drink to keep spirits lively and cozy at the reception. Your entire menu can reflect the time of year and winter is the best time for hot, toasty foods and drinks to be served. A warm, cozy, roaring fire is just about as romantic as it gets. If your reception offers a fireplace, run, don’t walk (we’re kidding–always walk around fire!). Your guests will feel rosy and merry if your wedding offers a place to enjoy some extra warmth. Yup, we think winter weddings are pretty awesome. Don’t forget to consider venues that offer accommodations as well, because the only damper on a winter wedding’s day is the biting cold and the chance for poor driving weather. But if your site offers rooms on site or even fairly close, guests are more likely to linger at the party instead of bustling home before night falls. Want more winter wedding tips? 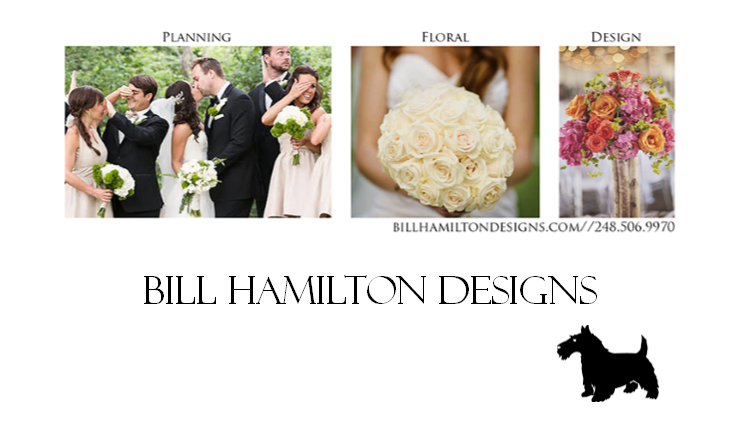 Give us a call at Bill Hamilton Designs. We’ve got lots of snowy day experience and we’d love to help make your experience the best!